So it's Day Two of my one-milky-recipe-a-day-for-a-week challenge! This time I've combined all the goodness of milk with the added nutrition that fish and seafood offers. 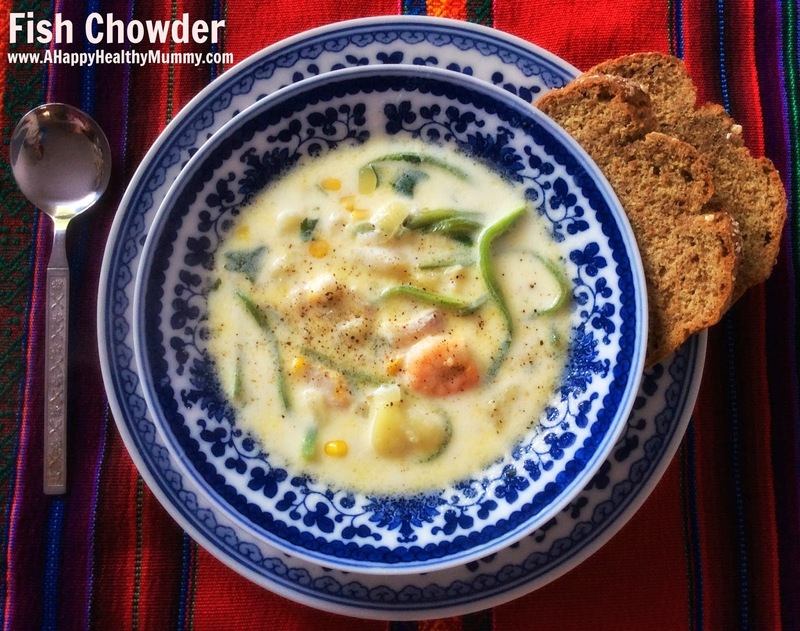 Alongside the calcium, protein, carbohydrates, vitamins and minerals milk affords, the prawns, scallops, haddock and cod included in this satisfying soup will also bring heart-healthy, omega-3 fatty acids, vitamin B12, iron and zinc to the table (and bump up still further the protein and calcium content). That's a lot of goodness for something that tastes fab and fills you up! I used a BBC Food recipe as the basis for my soup, but obviously I BOUGHT the soda bread, because cooking the chowder was my main focus this time round. I didn't use clams as the recipes suggests - and had to switch cod for pollock as I couldn't find any in the shops. And instead of a shallot in the first stage I used half an onion! Although cooking the dish isn't hard, it is time-consuming - and not one to be tackled if you have kids around that are likely to need attention every five minutes (although I soldiered on!!). The results were certainly worth it! Boil the potato until it is cooked but still firm, when it is cool, cut into bite-sized pieces. Poach the haddock in the milk, skin side up with the bay leaf and half onion. Set aside. In a pan large enough to hold all of the ingredients, fry the onions in the butter. Stir in the garlic, potato, sweetcorn and green veg. Remove the haddock from the milk (but keep the milk! ), pop it onto a plate and tear into pieces. Strain the milk and add that to the onion, potatoes and veg pan. Simmer gently for 20 minutes and then add the haddock, scallops, prawns and cod. Heat gently until all the fish and seafood is cooked. Toss in the fresh parsley, then ladle the soup into bowls and grind over some pepper. Sounds lovely! And very nutritious. When (if ever) I get a free half an hour, I might give it a go. Suppose you could make a big batch of it and then freeze individual portions. I like a good chowder! I did reheat a couple of times, as my initial batch was more than 2 servings. I'm pleased to say it kept well! Freezing small portions is a way of life here - it's good to know on a day when I can't face cooking I can just get out from the freezer something I know is good for me (rather than resort to a take-away, which I always regret! ).